"Musings on music. New Discoveries and Old Favorites"
I have a confession to make. I have always enjoyed everything I have ever heard from John Gorka, Lucy Kaplansky, and Eliza Gilkyson, but I don’t have any of their albums. Those aren’t just random names; rather, they are the members of the “folk super group” Red Horse. On their self titled debut as a group, they revisit many of their older songs, but I am hearing them for the first time. This is both an advantage and a disadvantage. I cannot comment on how they have reworked the songs for this project, but I can tell you what it is like to hear these songs with fresh ears. It is a treat. The format here is a sort of songwriters’ round robin. Each of the artists contributes four songs; one of their own, one by each of their fellow group members, and one cover. For their four songs, each artist recorded a basic track with their own chosen backing musicians, and then sent it to the other two to add background vocals. This could have easily sounded like three EPs, but the sound is remarkably consistent throughout. The cover songs tell you something about each artist. Lucy Kaplansky leads the group through Wayfaring Stranger, a song that has been following me around lately. It’s a folk standard, and if you’re going to do it, you had better inhabit the song, and make its emotions run true. Red Horse does that. Eliza Gilkyson leads on a song Neil Young wrote for Buffalo Springfield, I Am a Child. This version asks the question, “What if Neil Young had instead written the song for CSNY?” The answer presented here is, it would have worked beautifully. John Gorka knows that this album will be heard by many people in the folk world, so his cover is a beautiful song that he believes deserves a wider audience. Coshieville was originally by a group called Men of Worth, and it is a very moving ballad of lost love. Gorka and Co make it sound like a folk standard, and make the case that it should be one. There is only one new song on the album. John Gorka wrote If These Walls Could Talk for this project, and he also performs it here. It is a fine example of his artistry. 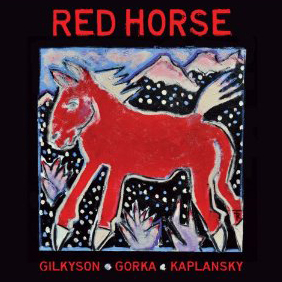 The other originals are songs that Kaplansky and Gilkyson had previously recorded on their own albums. But the real fun of a project like this is hearing the artists perform each other’s songs. The highlight here for me is Lucy Kaplansky’s performance of Gilkyson’s song Sanctuary. The song is a hymn, and it starts out sounding like a statement of religious faith, but it turns into a statement of love. Maybe it’s both. Kaplansky performs it with only a piano for accompaniment, and the background vocals add a gospel flavor that suits the song perfectly. This one is a show stopper. The rest of the songs are all very fine, and I suspect that they will grow on me. Certainly, this is a collaboration that never disappoints. But I will say this. I know of two other groups like this, Red Bird and Cry Cry Cry. Each one delivered a fine album, and then never was heard from again as a group. For Red Horse, that would be a shame. They are currently touring together, and I would love to have them come off the road and go into the studio together and record an album live with no overdubs. I know that there is enough talent here to make a great album that way, and, if it happens, I will be happy to report back. If it doesn’t, I hope to do a better job of keeping track of their solo work. This album certainly gives me plenty of reasons to want to do so.